It took place in 1820 when Joseph Smith was 14 years old. Joseph Smith was wondering which church to join, and decided to ask God. He prayed in a grove of trees, and was visited by God the Father and Jesus Christ. Jesus told him all churches were wrong and that he should join none of them. Joseph Smith was 15 years old. Joseph Smith went into the wilderness to pray for forgiveness of his sins. Jesus came down and told him all churches were wrong, and that his sins were forgiven. In other versions, Joseph Smith talks about seeing angels as well. If Joseph Smith really did see both God the Father and Jesus Christ, wouldn’t he have included that detail in the version he personally wrote in 1832? What purpose could there be to omit that fact? That would be one of the most important things to ever happen if it were true. Wouldn’t his first story be more accurate than later stories? I was previously convinced Joseph Smith did see God and Jesus, which is why I spent two years on a mission trying to teach the story to others. But when I realized his original story was so much different from what I had been taught my whole life, and what I had taught countless others on my mission, I was sad and disappointed. I had been teaching something without giving a full disclosure of all the details, because the same details had never been disclosed to me. To me it smacked of a cover-up or a whitewashing of history. It’s true that the LDS church is doing a little better by having the Gospel Topics Essays page (where the essays ironically have very little to do with the gospel), but they don’t exactly advertise the page is there. I found the essays from so-called “anti-Mormon” sites. You won’t find the essays unless you know what you’re looking for. It was a bitter pill to swallow to find out that the story of the first vision as found in the LDS scriptures isn’t the original story, and to me has obvious signs of being fabricated. Click on the image from MormonInfoGraphics.com to see it full size. 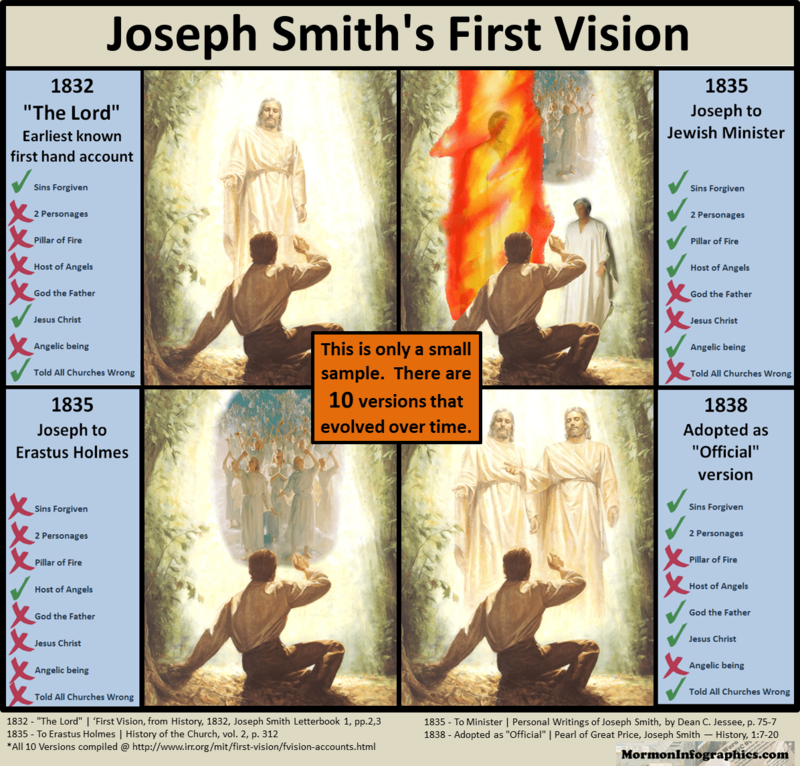 For more information, view the Mormon Infographics’ website: Joseph Smith’s First Vision and His Conflicting Accounts.